افندی زاده, شهریار, معمارنژاد, امیرمسعود. (1395). برآورد زمان سفرحمل ونقل همگانی (اتوبوس) با بهره گیری از داده‌های نرم افزار SCATS و بلیط الکترونیک (مطالعه موردی شهر تهران). پژوهشنامه حمل و نقل, 13(4), 146-162. شهریار افندی زاده; امیرمسعود معمارنژاد. "برآورد زمان سفرحمل ونقل همگانی (اتوبوس) با بهره گیری از داده‌های نرم افزار SCATS و بلیط الکترونیک (مطالعه موردی شهر تهران)". پژوهشنامه حمل و نقل, 13, 4, 1395, 146-162. افندی زاده, شهریار, معمارنژاد, امیرمسعود. (1395). 'برآورد زمان سفرحمل ونقل همگانی (اتوبوس) با بهره گیری از داده‌های نرم افزار SCATS و بلیط الکترونیک (مطالعه موردی شهر تهران)', پژوهشنامه حمل و نقل, 13(4), pp. 146-162. افندی زاده, شهریار, معمارنژاد, امیرمسعود. برآورد زمان سفرحمل ونقل همگانی (اتوبوس) با بهره گیری از داده‌های نرم افزار SCATS و بلیط الکترونیک (مطالعه موردی شهر تهران). پژوهشنامه حمل و نقل, 1395; 13(4): 146-162. به دست آوردن یک زمان سفر دقیق لزوما باید تمامی این عوامل تاثیر گذار در نظر گرفته شود. عمده مدل‌های توسعه یافته در زمینه برآورد زمان سفر اتوبوس‌ها صرفا از داد‌های تاریخی وابسته به زمان استفاده نموده‌اند‌. 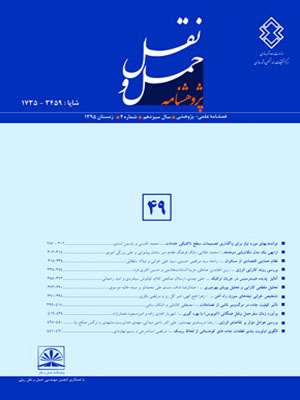 در این تحقیق برپایه نگرشی نو علاوه بر در نظر گرفتن عامل وضعیت جریان ترافیک به عنوان عامل تاثیر گذار در تعیین زمان سفر اتوبوس‌ها، از اطلاعات مربوط به تقاضای سفر مسافران جهت برآورد زمان سفر استفاده گردیده است. همچنین مدلی براساس داده‌های تاریخی که صرفاً از متغیرهای زمانی(زمان از روز و روز از هفته) استفاده می‌کرد و مدلی با تمرکز بر روی وضعیت جریان ترافیک که فقط از احجام عبوری و درجه اشباع تقاطعات پایین دست استفاده می‌نمود نیز، جهت مقایسه توسعه یافتند. در نهایت مدل شبکه عصبی پیشنهادی در قالب یک مطالعه موردی ارزیابی گردید. نتایج نشان دهنده عملکرد بهتر مدل پیشنهادی در قالب شاخص میانگین درصد خطای مطلق و جذر میانگین مربعات می‌باشد. data-based model which uses temporal variables (time of day, day of week) as an input. This paper develops artificial neural network (ANN) models to predict bus travel time by using range of input variables including traffic flow data and passenger demand collected from a bus route in Tehran, Iran. The paper examines the proposal model by comparing with two alternative models. A historical data-based model which uses temporal variables and a traffic flow data-based model which only uses traffic flow parameters as an input. The results show that the proposal model outperforms other model in RMSE and MAPE index. - Chien, S.I.J., Ding, Y. and Wei, C. (2002). “Dynamic Bus Arrival Time Prediction with Artiﬁcial Neural Networks.” Journal of Transportation Engineering, Volume 128, Number 5, pp. 429-438. - ZK Gurmu and wei Fan (2014), “Dynamic Travel Time Prediction Models for Buses Using Only GPS Data” .Transportation Research Broad Annual meeting 2014, 14-0378. - Hagan, M. T., Demuth, H. B., and Beale, M. (1996). “Neural network design”,PWS, Boston. - Hoogendoorn, S. & Van Lints, H (2008), Reistijdvoorspellingenen.reistijdbetrouwbaarheid. NM Magazine, 2008, 3. - Jeong R.H.(2004), "The Prediction of Bus Arrival time Using Automatic Vehicle Location Systems Data", A Ph.D. Dissertation at Texas A&M University. - (Li 2006) Li, R. (2006), “Enhancing motorway travel time prediction models through explicit incorporation of travel time variability.” Ph.D. thesis, Monash Univ., Melbourne, Australia. - Lin, Y., Yang, X., Zou, N., and Jia, L. (2013), ”Real-Time Bus Arrival Time Prediction: Case Study for Jinan, China.” J. Transp. Eng., 139(11), pp.1133–1140. - Lin, H.-E. and Zito., R. (2005), "A review of travel time prediction in transport and logistics", In Proceeding of the Asia Society for Transportation Studies, Vol. 5, pp. 1433-1448. - Liu, H. (2008), “Travel time prediction for urban networks.” Ph.D. thesis, Delft Univ. of Technology, Delft, Netherlands. - Mazloumi, E., Rose, G., Currie, G., and Moridpour, S. (2011),“Prediction intervals to account for uncertainties in neural network predictions: Methodology and application in bus travel time prediction.” Eng. Appl. Artif. Intell., 24(3), pp.534–542. - Ramakrishna Y, Ramakrishna P, Sivanandan R (2006), “Bus Travel Time Prediction Using GPS Data”, proceedings, Map india 2006. - Shalaby, A., and A. Farhan. (2004), “Bus Travel Time Prediction for Dynamic Operations Control and Passenger Information Systems”. CD-ROM. 82ndAnnual Meeting of the Transportation Research Board, National Research Council, Washington D.C.
- T. Thomas, W.A.M. Weijermars and E.C. Van Berkum (2010), .Predictions of Urban Volumes in Single Time Series, IEEE Transactions on intelligent transportation systems, vol. 11, no1, pp. 71-80. - Tu, H. (2008), “Monitoring Travel Time Reliability on Freeways”. Transportation and Planning. Delft, Delft University of Technology. - J.W.C. van Lint, S.P. Hoogendoorn and H.J. van Zuylen (2003), “Accurate freeway travel time prediction with state-space neural networks under missing data”, Delft University of Technology, The Netherlands. - Lei Wang , Zhongyi Zuo , Junhao Fu (2014)­, “Bus Arrival Time Prediction Using RBF Neural Networks Adjusted by Online Data” The 9th International Conference on Traffic and Transportation Studies (ICTTS 2014), 14 July 2014, Volume 138, pp. 67–75. - Williams, B. and Hoel, L. (2003), Modeling and forescating vehicle traﬃc ﬂow as a seasonal arima process: Theoretical basis and empirical results. Journal of Transportation Engineering, 129(6): pp.664–672.